The UPR Plug N Play ï¿½ Catch Can Features Multiple Chamber and Multiple Stages along with a complex series of Coalescing Filters at different micron levels. Along with being the only Plug N Play ï¿½ Catch Can System featuring a solid mount to the engine block and not on the supercharger or fender. This system also features a quick release knob that allows you to push the button on the fittings to be able to remove the entire catch can without any tools. 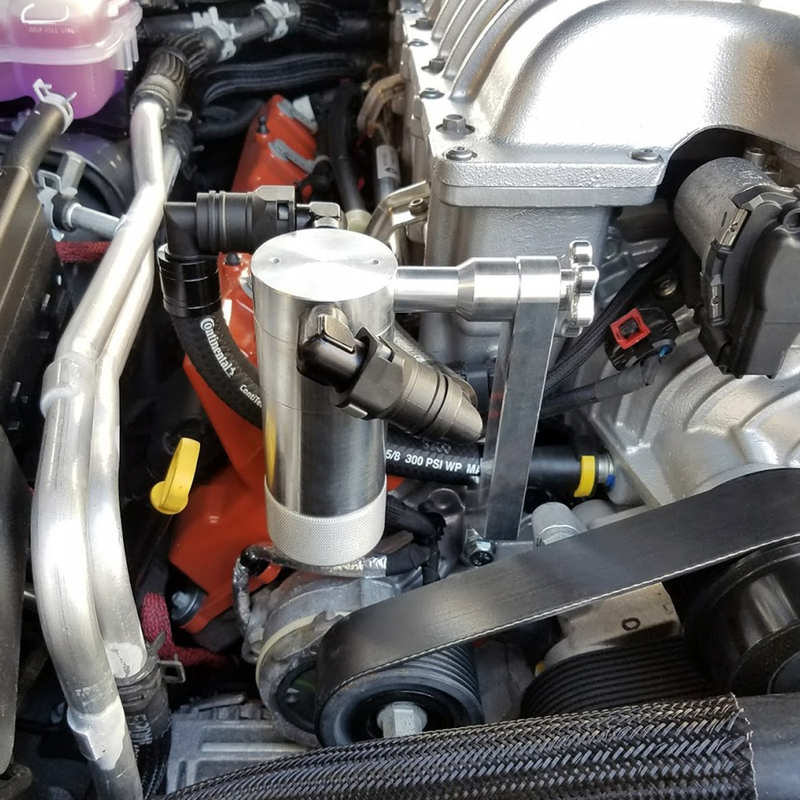 Custom driver side Plug N Play ï¿½ PCV Hose with our exclusive coalescing filter installed to control oil. The Driver Side Hose Upgrade will need to be assembled once you get it to be an exact fit. The driver side hose includes 10" of UPR braided hose, 2pc 45deg UPR Plug n Playâ¢ fittings, 2pc UPR Billet Hose Ends. Also, for those that have a VPS sensor in the driver side hose they will need to heat the factory plastic line with a lighter and then the sensor can be pulled apart easily and reinstalled with the new braided line. HellCat Demon owners should be aware of the 2-chamber catch cans that run a screen like the units listed below are just inferior copies of one another without any improvements to the design or oil separation performance. Moroso Catch Can ï¿½ Inferior 2 Chamber Pull Through Oil Catch Can with Generic Screen SpeedLogix Catch Can ï¿½ Inferior 2 Chamber Pull Through Oil Catch Can with Generic Screen Billet Technology Catch Can ï¿½ Inferior 2 Chamber Pull Through Oil Catch Can with Generic Screen The Lack of efficiency in 2-chamber Catch Cans has been tested and proven to allow as much oil into the intake as it collects not providing a true solution for oil ingestion into the manifold and combustion chamber. Mainly because the design requires a better-engineered diffuser system and not just a generic screen. It's very important to catch as much oil as possible. The primary function of an oil separation system is to eliminate fuel degradation and any possibility of engine knock known as detonation from oil entering the combustion chamber. ï¿½ Billet Catch Can Size 2.25" x 5.75"
Installs in 10-15 minutes or less. Click Here for 5028-214 Instructions Click Here for 5028-214-CSCC Instructions Installs in 10-15 minutes or less. Dodge Charger Challenger 6.2 Hellcat Demon No one else can stack up to the bold clean styling of our aftermarket Billet dress ups, Street Strip & Racing Suspension & Performance Parts for your late model American Muscle Car!